Abu Dhabi: The UAE announced the institution of a prestigious global award for agricultural innovation on Monday at a global event in the capital. The Shaikh Zayed Prize for Pioneering Innovations in Agriculture was announced at the opening ceremony of the Global Forum for Innovations in Agriculture (GFIA). Held under the theme ‘Driving Innovation for an Agricultural Revolution,’ the three-day event showcases innovations in sustainable agriculture and has brought together an array of world-renowned innovators, investors, food producers, retailers, governments, scientists, non-governmental organisations and agricultural organisations. Delivering the inaugural speech on behalf of Shaikh Mansour Bin Zayed Al Nahyan, Deputy Prime Minister and Minister for Presidential Affairs, Dr Rashid Ahmad Bin Fahd, Minister of Environment and Water, announced the award without revealing further details. The first Shaikh Zayed Prize for Pioneering Innovations in Agriculture will be awarded at the second GFIA to be held next year, a senior official told Gulf News. The government will constitute a special committee to take care of the award, which will reward innovations in agriculture across the globe, Mohammad Jalal Al Raisi, director of communication and community service at Abu Dhabi Food Control Authority (ADFCA), said. The modalities of the award are being finalised and the details will be announced soon. Al Raisi said the prize will be one of the most prestigious awards in the agriculture sector in the world. He said local farmers have started registering for sustainable agricultural programmes launched by ADFCA at the event. Each farmer will receive five tonnes of organic fertiliser at a subsidised rate, the official said. The minister highlighted the UAE’s achievement in sustainable farming in his speech. He expressed hope that the GFIA will be instrumental in developing a new global farming model that does not harm the environment. Under the title ‘Visions for an Agricultural Revolution’, the opening ceremony was chaired by BBC journalist and broadcaster Stephen Sackur. Bill Gates, co-founder of the Bill & Melinda Gates Foundation, addressing the ceremony via video address said: “If you care about the poorest, you care about agriculture [because most of the poorest are farmers in this world].” Investments in agriculture are the best weapons against hunger and poverty and innovations are needed to help the poorest seize agriculture’s potential, he said. Gates hoped that another agricultural revolution [like the green revolution in the previous century] would be possible in this generation’s lifetime. Organised in strategic partnership with ADFCA and with official support from the UAE’s Ministry of Environment and Water and Ministry of Presidential Affairs, the event includes an exhibition with over 125 exhibitors, an 1,800-delegate conference comprising keynote sessions, panel discussions, an African Ministerial discussion and 150 presentations on innovations by 180 speakers. 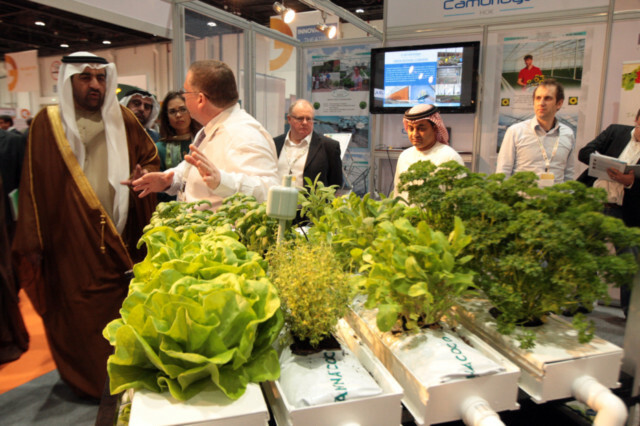 Day One of GFIA also featured the GFIA Power Sessions, the world’s largest and most diverse presentation of big ideas on sustainable agriculture. A total of 52 innovators across four theatres demonstrated their technology or projects.